An all-electric version of Audi's upcoming Q8 SUV has been approved for production, according to Autocar citing senior company sources. The battery-powered version of the Q8 SUV due in 2017 will use battery and electric powertrain technology from the upcoming R8 e-tron supercar, with Audi engineers targeting a practical range of 370 miles (592 km). The R8 e-tron project was recently reprised, with the updated car getting 400km (248.5 miles) range. 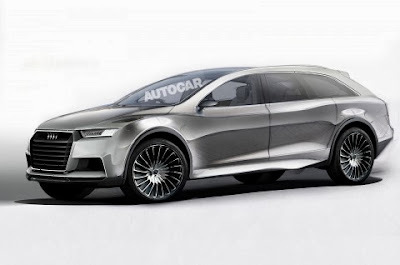 The new Q8 model is aimed directly at the upcoming Tesla Model X SUV, which is due to be launched later this year. Like the Tesla, the Q8 e-tron will will be AWD with electric motors driving the front and rear wheels. The Q8 e-tron is expected to have a large battery pack, at least equal to the 80 kWh pack that will be available in the Tesla. Battery technology is expected to make significant advances by the time the Q8 arrives, which will improve its potential range.